Archer was born in Bradford, Yorkshire. She attended Grange Upper School and, after graduating, first worked as a sewing machine operator. She attended Bradford College in 1980 to study typing, and then became a clerk at Leeds Magistrates' Court. Archer joined a group called Dignity as a backing vocalist, and played with different bands around the Bradford area. She helped out at a recording studio in Bradford called Flexible Response, and subsequently began working with musicians John Hughes and John Beck as "The Archers." During this time, Archer developed skills in the music business. Archer signed to EMI in 1990, and released her first single, "Sleeping Satellite" in August 1992, which went to number one on the UK Singles Chart. The single also enjoyed minor success in the US, where it peaked at number 32 on the Billboard Hot 100. The album Great Expectations followed in October 1992. It reached number eight on the UK Albums Chart, and achieved gold disc status by December for sales of more than 100,000 copies. Further singles from the album followed, and although they were Top 40 hits in the UK, they did not achieve the same level of success as her début. Archer donated the royalties from her second single "In Your Care" to Childline. The song was about child abuse. In 1993 Archer won a BRIT Award for the Best British Breakthrough Act. However, she later joked that she kept her award in the back of her kitchen cupboard, and claimed that she used it for cracking nuts and tenderising steak. After disappearing from the limelight, Archer reappeared in 1996 with her second album Bloom. However, the single "One More Good Night with the Boys" failed to reach the UK Top 40, and the album peaked at number 95. In late 1997, disagreements with EMI left Archer somewhat disillusioned and feeling like she had been treated as a commodity. She decided to take a short break from the industry. This break was to last a total of two years. After the break, Archer felt the time was right to start writing again, but now she was hindered by writer's block. Although this did not prevent her from being initially creative, she found it difficult to finish anything musically. However, she did not let this stop her from expressing her creativity in other ways, and she began painting and moulding clay. After working through the block and starting in 2002, Archer and Hughes worked on a new album. Initially this was going to be titled Non-Linear, but later became On. Several demo versions of the songs from this album were available for free from the messagetothemagnet website, which was created for the purpose. People were encouraged to send feedback on the material. On was released on 25 September 2006 on Archer's own label, Quiverdisc. It was preceded on 20 September by a download-only single, "Every Time I Want It (Effect Is Monotony)", a radio edit of the album track "Effect Is Monotony." In a 2006 interview, Archer said she and John Hughes were pursuing opportunities to write for film and TV soundtracks. Subsequently, the partners provided work for EastEnders and other shows. Archer is in a long-term relationship with musician John Hughes. In 1999, she bought a Sunderland A.F.C. season-ticket, after attending a match with Hughes. "Lords of the New Church"
"One More Good Night with the Boys"
Top 100 peaks: "Official Charts Company: Tasmin Archer". The Official UK Charts Company. Retrieved 28 November 2015. 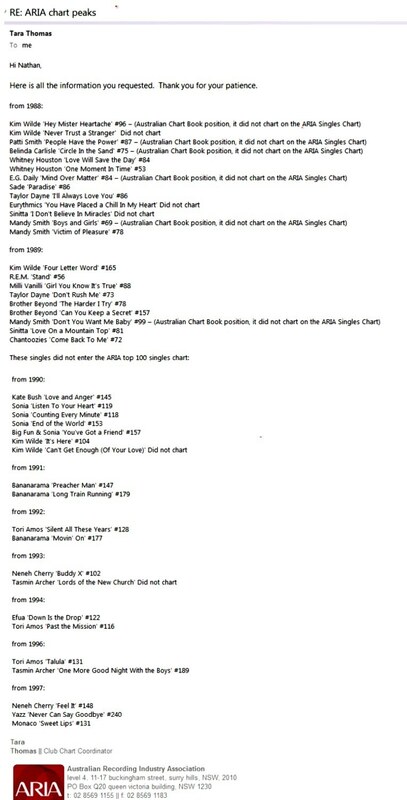 Top 200 peaks from November 1994 to December 2010: "Chart Log UK 1994–2010 > A – Azzido Da Bass". Dipl.-Bibl. (FH) Tobias Zywietz. Retrieved 28 November 2015. 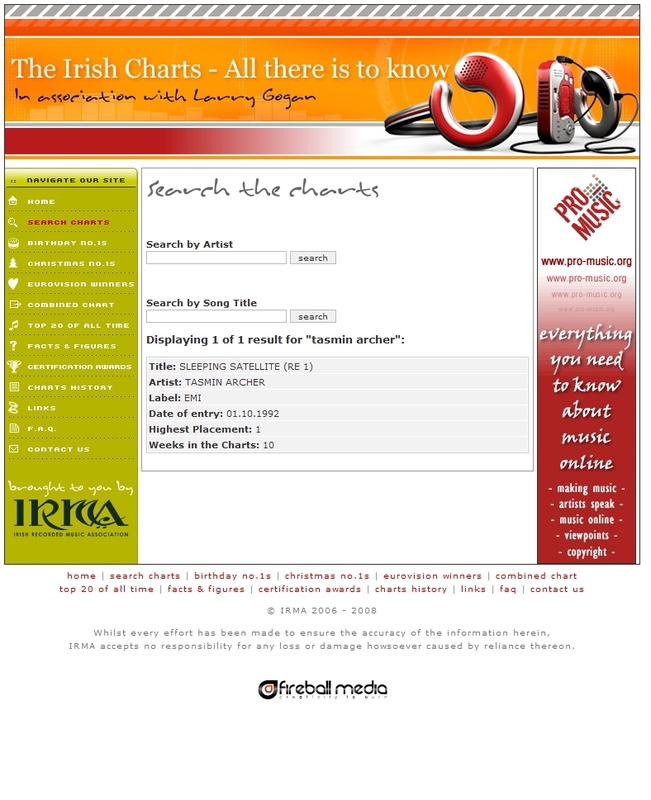 ^ a b "The Irish Charts – All there is to know > Search results for 'Tasmin Archer' (from irishcharts.ie)". Fireball Media. Retrieved 28 November 2015. ^ a b "Tasmin Archer". Retrieved 7 November 2015. ^ Roberts, David (2006). British Hit Singles & Albums (19th ed.). London: Guinness World Records Limited. p. 27. ISBN 1-904994-10-5. ^ a b "Billboard > Tasmin Archer > Chart History > The Hot 100". Billboard. Retrieved 6 December 2018. 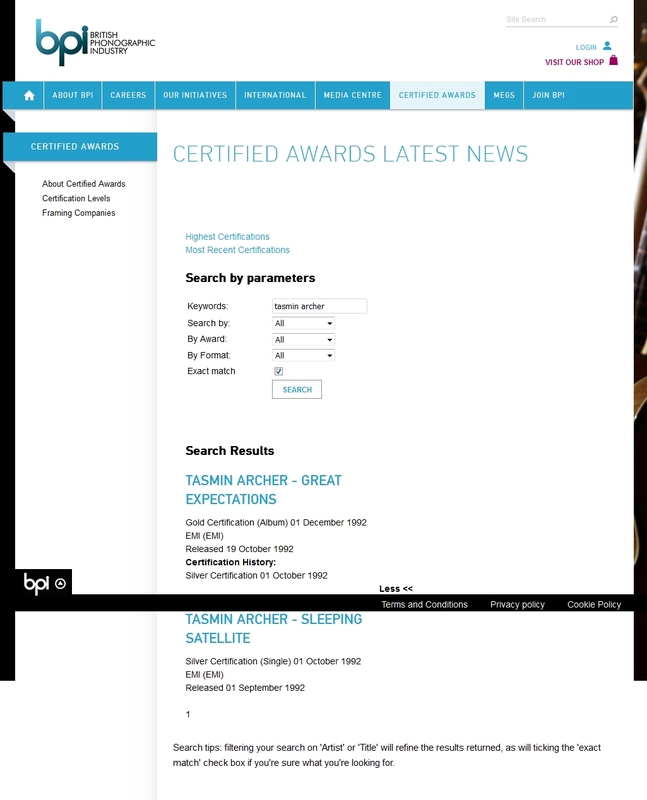 ^ a b c "Screen shot of search results for 'Tasmin Archer' from (from bpi.co.uk)". British Phonographic Industry. Retrieved 28 November 2015. ^ Lister, Derek A J (2004). Bradford's Own. Sutton Publishing. ISBN 0-7509-3826-9. ^ a b "Tasmin Archer interview". Retrieved 7 November 2015. ^ Freeman, Sarah (20 September 2006). "High expectations for singer Tasmin's return". Yorkshire Post. Retrieved 23 August 2012. I needed to do something creative which had an end result. If you have writer's block, obsessing about it is the worst thing you can do and I knew that whatever else happened I had to get on with things. My partner John is a massive Sunderland fan; I went with him to a game and, that was it, I was hooked. Turning to football didn't cure the writer's block, but it helped. In the end there was no Eureka moment, it just gradually lifted. Suddenly I was able to finish all those half-written songs. Top 50 peaks: "australian-charts.com > Discography Tasmin Archer". Hung Medien. Retrieved 28 November 2015. Top 100 peaks: Ryan, Gavin (2011). Australia's Music Charts 1988–2010 (pdf ed.). Mt. Martha, VIC, Australia: Moonlight Publishing. p. 17. "In Your Care" and Bloom: "Response from ARIA re: chart inquiry, received 15 July 2015". Imgur.com. Archived from the original on 16 July 2015. Retrieved 28 November 2015. "Lords of the New Church" and "One More Good Night with the Boys": "Response from ARIA re: chart inquiry, received 17 June 2014". Imgur.com. Archived from the original on 29 November 2014. Retrieved 28 November 2015. ^ "austriancharts.at > Tasmin Archer (albums)". Hung Medien. Retrieved 28 November 2015. ^ "Offizielle Deutsche Charts > Tasmin Archer - Great Expectations (album) (in German)". GfK Entertainment. Retrieved 28 November 2015. ^ a b "charts.org.nz > Discography Tasmin Archer". Hung Medien. Retrieved 28 November 2015. ^ a b "swedishcharts.com > Discography Tasmin Archer". Hung Medien. Retrieved 28 November 2015. ^ "hitparade.ch > Tasmin Archer (albums) (in German)". Hung Medien. Retrieved 28 November 2015. ^ "Billboard > Tasmin Archer > Chart History > Billboard 200". Billboard. Retrieved 6 December 2018. ^ "austriancharts.at > Tasmin Archer (songs)". Hung Medien. Retrieved 28 November 2015. ^ "Ultratop > Tasmin Archer (in Dutch)". Hung Medien. Retrieved 28 November 2015. ^ "lescharts.com > Discographie Tasmin Archer". Hung Medien. Retrieved 28 November 2015. "Sleeping Satellite": "Offizielle Deutsche Charts > Tasmin Archer – Sleeping Satellite (single)" (in German). GfK Entertainment. Retrieved 8 September 2016. "Somebody's Daughter": "Offizielle Deutsche Charts > Tasmin Archer – Somebody's Daughter (single)" (in German). GfK Entertainment. Retrieved 8 September 2016. ^ "dutchcharts.nl > Tasmin Archer (singles) (in Dutch)". Hung Medien. Retrieved 29 November 2015. ^ "hitparade.ch > Tasmin Archer (singles) (in German)". Hung Medien. Retrieved 28 November 2015. This page was last edited on 14 April 2019, at 18:39 (UTC).